According to The Institute of Physics, Nanotechnology encompasses the understanding of the fundamental physics, chemistry, biology and technology of nanometre-scale objects. Nanotechnology is the manipulation of matter and objects on an atomic and molecular scale. These materials measure from one to one hundred nanometers. One nanometer is equal to one billionth, or 10−9, of a meter. Nanotechnology is a key technology for the future and governments have invested billions of dollars in its future. Now, researchers are looking at applying this technology to other items such as surgical gloves to enhance and expand its use in medical procedures. The intricate properties of the fingertips have been mimicked and recreated using semiconductor devices in what researchers hope will lead to the development of advanced surgical gloves. 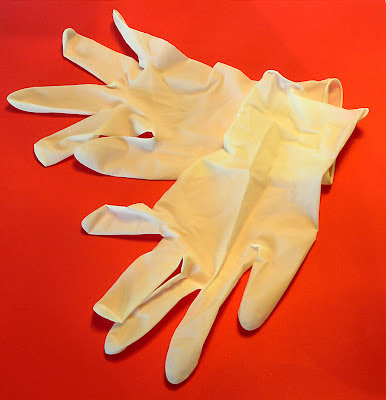 The devices, shown to be capable of responding with high precision to the stresses and strains associated with touch and finger movement, are a step towards the creation of surgical gloves for use in medical procedures such as local ablations and ultrasound scans. Researchers from the University of Illinois at Urbana-Champaign, Northwestern University and Dalian University of Technology have published their study today, Friday 10 August, in IOP Publishing's journal Nanotechnology. Offering guidelines to the creation of these electrotactile stimulation devices for use on surgeons' fingertips, their paper describes the materials, fabrication strategies and device designs, using ultrathin, stretchable, silicon-based electronics and soft sensors that can be mounted onto an artificial 'skin' and fitted to fingertips. "Imagine the ability to sense the electrical properties of tissue, and then locally remove that tissue, precisely by local ablation, all via the fingertips using smart surgical gloves. Alternatively, or perhaps in addition, ultrasound imaging could be possible," said co-author of the study Professor John Rogers. The researchers suggest that the new technology could open up possibilities for surgical robots that can interact, in a soft contacting mode, with their surroundings through touch. The electronic circuit on the 'skin' is made of patterns of gold conductive lines and ultrathin sheets of silicon, integrated onto a flexible polymer called polyimide. The sheet is then etched into an open mesh geometry and transferred to a thin sheet of silicone rubber moulded into the precise shape of a finger. This electronic 'skin', or finger cuff, was designed to measure the stresses and strains at the fingertip by measuring the change in capacitance – the ability to store electrical charge – of pairs of microelectrodes in the circuit. Applied forces decreased the spacing in the skin which, in turn, increased the capacitance. The researchers experimented with having the electronics on the inside of the device, in contact with wearer's skin, and also on the outside. They believe that because the device exploits materials and fabrication techniques adopted from the established semiconductor industry, the processes can be scaled for realistic use at reasonable cost. "Perhaps the most important result is that we are able to incorporate multifunctional, silicon semiconductor device technologies into the form of soft, three-dimensional, form-fitting skins, suitable for integration not only with the fingertips but also other parts of the body," continued Professor Rogers. Indeed, the researchers now intend to create a 'skin' for integration on other parts of the body, such as the heart. In this case, a device would envelop the entire 3D surface of the heart, like a sock, to provide various sensing and actuating functions, providing advanced surgical and diagnostic devices relevant to cardiac arrhythmias. Future challenges include creating materials and schemes to provide the device with wireless data and power.